When cash is the main form of payment in your business, you need to be a bit creative. One of the mistakes that people make is sticking with the manual handling of cash and that cause inefficiency as well as reducing the performance of the business. That is why it is important to automate the process of cash handling by the use of the machine. That is why cash counting machine with fake note detector are increasingly becoming popular with most businesses that deals with cash. Business inefficiencies can be seen from different angles. For instance, you might find out that you are taking too long to get the count of the cash in the business. It could also be that you never get reconcile the amount of cash in the business. Another case of clear inefficiency is taking too long to serve the customer. These are inefficiency problems that can be sorted out by these machines. The problem of cash counting accuracy is prevalent tot many businesses. However, it usually comes as a result of poor management of cash, especially for the businesses handling it manually. Miscounting is one of the common errors, and it gives wrong counts which can throw off cash balancing. Fixing it can be a problem and can take huge amounts of time. But with a cash counting machine with fake note detector, that will never be a problem. The cost of labor for many businesses is counted by the number of hours you pay the staff. If you are dealing with cash manually, it simply means that you will pay more for the extra hours. 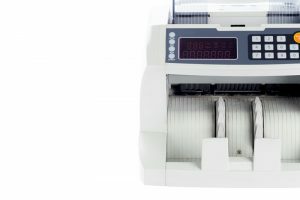 With a cash counting machine with fake note detector, you will reduce the number of hours that you need to hire workers. That will significantly reduce the cost of labor for your business. The issue of fake money is increasingly becoming prevalent in the financial market. The modern criminals are making high quality fake notes, and that requires high quality technology to detect. That is another reason for business dealing with cash to use a cash counting machine with fake note detector.